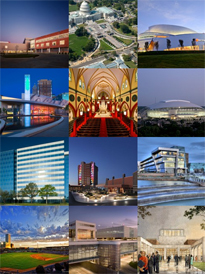 Manhattan’s portfolio is diverse and spans multiple business industries and segments of government and education. Our project experience across different markets and geographic regions creates an environment at Manhattan that is abundant with the exchange of ideas. The best design ideas and construction methods used nationally and internationally are shared among team members and with our clients. This cross pollination of ideas enhances quality and sparks pioneering thought by the blending of the best of the best to deliver even better. Visit our market segment links on the left to learn more.